Batman has had phenomenal success in the cinematic world, most recently with the blockbuster success of director Christopher Nolan’s trilogy of Bat-films. This week, Marvel unleashed a spin-off of their successful “Avengers” film with the television series “Marvel’s Agents of S.H.I.E.L.D.” and are now able to flesh out their secondary (and entirely new) characters through long-form stories. TV has gained cachet and more respect over the years in the eyes of actors and filmmakers, with special effects improving and top-tier talent behind and in front of the camera flocking to the once-considered step-child of cinema. Warner Bros., then, should have no fear about placing one of their most prestigious characters on the small screen. Batman and his rich, vast cast of supporting characters and villains (as well as Gotham City itself) is ripe for a television series that can showcase Batman and his world in ways that have not been portrayed (or properly portrayed) in film. Bruce Wayne’s detective skills have always gotten short shrift in his films, with the action overpowering the detecting. This can only be rectified, I believe, in a live action television series. Relationships between him and his Bat-family, as well as the city overall, can be mined and fleshed out, revealing more depth to the character. The general public loves Batman in the movies. If they were able to see what could be done with him in a long-form series, they would be able to see how amazing and complex a character he really is. A serialized television show is the best way to adapt any comic book character, but the expense alone makes it a daunting task. It is possible, however, to adapt Batman to the small screen. The budget would not have to be blockbuster movie-sized, but enough money can be spent to make many of the show’s elements look stunning, such as the costumes, cinematography, and makeup. If shows such as “Game of Thrones” and “Boardwalk Empire” can be built to look cinematic, then they can definitely make a Batman show that is of the highest quality. Like those programs, Batman would be ideal for HBO or any other pay or cable channel. Restrictions placed on network television would not apply on those channels, and seasons could be as long or as short as the creative team deems appropriate. Layered Batman stories can be told over several episodes that could not possibly be done in a single film. 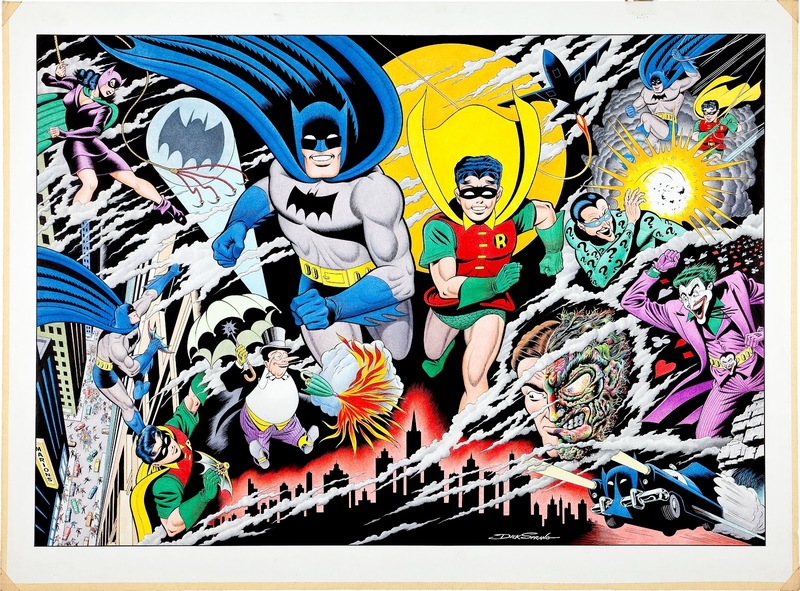 Viewers would become invested in Batman and his world if longer stories were able to be told over several episodes at a time or even over a whole season. Adaptations of classic past and modern-day Bat-stories, such as Scott Snyder’s “The Black Mirror” and Frank Miller’s “Year One”, could easily be filmed, with television allowing every character and their story to be fleshed out without the adapted work being truncated or even cut to where it’s unrecognizable to the source material. Batman’s detecting skills are one of his defining traits. There’s a reason he’s called the Dark Knight Detective and the world’s greatest detective. Through adaptations of comic book stories, or even original tales, Bruce Wayne’s skills at fighting crime with not just his superior physical prowess, but with his superior mind, would show the non-comic book reading public why Batman comic book readers revere this character. Warner Bros. has loads of stories to mine from DC Comics’ vault over Batman’s close to seventy five year history. These tales are character-defining and are diverse in tone, style, and genre. Batman is adaptable to any style, which is only one of the many reasons he’s, in my humble opinion, the greatest fictional character (and my favorite). Another one of the many reasons why Bat-fans love the character is the rich supporting cast that resides in his heart and in his city. The use of Robin in the series can be done right for certain story arcs, building up the character and demonstrating why he’s essential to the mythos. Bruce Wayne’s relationships with Commissioner James Gordon, his butler and father figure Alfred Pennyworth, and even the Gotham Police Department can be shown to great effect in a TV series. The relationship Batman has with Catwoman, who straddles the line between friend and foe (and lover), can be a possibility as well. Anne Hathaway’s performance of her in “The Dark Knight Rises” was popular with viewers, making the character ripe for the small screen. Many will say, “Well how can you translate Batman’s villains to television?” The 1960s Batman series was great for what it was (campy fun), but times have changed. Costumes don’t have to be cheesy, and costumed villains don’t even need to be utilized at all for many of the stories that are perfect for adaptation. For example, “The Black Mirror” storyline requires no costumed villains (except for a Joker moment, but that should not be difficult to stage or even excise from a script). Warner Bros. would not make a movie unless it had a major villain, but great Batman stories don’t always have to include colorful bad guys. Batman could deal with the mob (the Falcone family from “The Long Halloween”), psychotic “plainclothes” villains such as James Gordon Jr. from “The Black Mirror”, serial killers, and any myriad amount of characters who require no costume or makeup. Even costumed villains such as the Penguin and the Riddler could be portrayed amazingly without the camp factor or without a movie-sized budget. Character is what matters in a great story and Batman is one of the greatest. The time is now to start production on a television show (what with the imminent sequel to “Man of Steel” including Batman in the cast) showcasing Batman and “friends”, and, as fate would have it, Warner Bros. and the FOX network announced, after I had finished much of this article, that they are making a series titled “Gotham.” They couldn’t have picked a better night, because it was the same night as the premiere of “Marvel’s Agents of S.H.I.E.L.D.” program. DC and Warner Bros. have been slowly building their television world, with the “Arrow” show and a possible “Flash” program for next season on the CW channel. Let’s hope they’ve been thinking this Gordon-centric show through and it hasn’t been rushed to capitalize on the upcoming Batman/Superman team-up. “Gotham” will focus on a young detective James Gordon of the Gotham City Police Department before he met Batman. Interestingly, the show will also depict the villains of Gotham City. The idea is reminiscent of the stunning “Gotham Central” comic book series that was created and written by Ed Brubaker and Greg Rucka, where the detectives of the GCPD dealt with Batman’s villains without the help of the caped crusader. This is a great idea, but still does not include Batman in the mix. If this show is a hit, then maybe there’s hope for a series that has Bruce Wayne/Batman as the main protagonist and not a supporting character. He deserves to live on the small screen and grow there as he has grown in the pages of classic comic book stories for over seven decades. A high quality Batman show would be a fitting gift for the Dark Knight’s seventy-fifth birthday next year. A Bat-fan can hope. It would be defenitely fun watching Batman on TV again. But probably officials are afraid of a reincarnation from the 60s TV show. That there is a market of Batman fans craving for new stuff is undoubtfully. Therefore I kind of like the approach that is on now with “Gotham”. I can imagine that if the show goes successfully we will also see the transition of Bruce Wayne becoming Batman. But exactly this process is probably to close at the Nolan movies – still.